Copyright 2014: Brewers Inc. Towing | Ann Arbor Towing. All Rights Reserved. Now celebrating over 55 years of service! Weekend day shift tow truck drivers needed. Full/part-time, weeknights available also. Light and heavy duty. 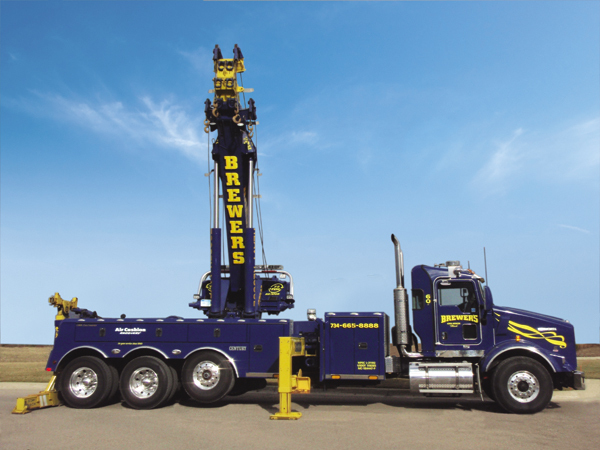 Brewer’s Inc., located in Ann Arbor, is one of the premier road service and recovery companies in the state of Michigan. Locally owned and operated by Dennis Brewer since 1963, Brewer's prides itself on providing safe, reliable, and high quality services. A 24-hour, seven-day-a-week Ann Arbor towing operation, Brewer’s is available for emergency Michigan roadside assistance and recovery needs, local and long distance towing, heavy duty towing, private property towing, specialized transporting, and equipment moving services. At Brewer’s, an owner or manager is on call 24 hours a day, seven days a week. Brewer’s employs 14 professional drivers and nine dispatchers. Our drivers average 16 years experience with the company and are professionally trained and committed to provide the highest level of service. The five most senior drivers average 36 years experience with Brewer’s. The drivers are supported by a team of knowledgeable phone operators and dispatchers located in a central dispatch office. Our 24-hour in-house dispatch team is trained to communicate effectively and do everything possible in a safe and honest manner to accommodate our customers. Our drivers operate a fleet of 25 road service units and have access to an additional 18 road service, recovery and service equipment units from Brewer’s sister company, Sakstrup's Towing. The fleet ranges from light duty tow trucks to a 75-ton rotator to specialized moving and hauling equipment. Brewer’s is ready to take on your most difficult challenges.